Thermocouples made by Thermo Sensor are used successfully for temperature measurements in solid, liquid or gaseous media up to +1,600 °C and are available in various designs and versions. Due to the high accuracy and quick response times our thermocouples enjoy a high degree of confidence among our customers. In addition, the simple operation ensures quick results. Because of our product variety we are able to offer you the best solution in nearly all industrial applications. All our thermocouples are made of class 1 material. 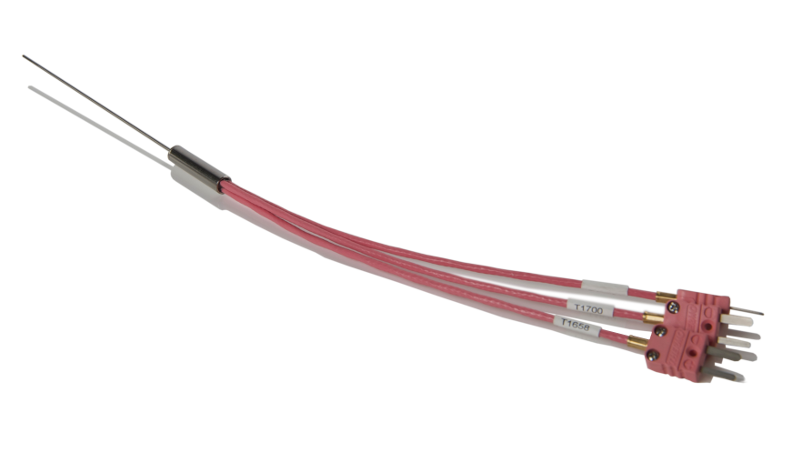 We can also supply thermocouples made of half class 1 material with a maximum deviation of 0.5 °C upon special request. Particularly in the field of the fast responding sheath thermocouples Thermo Sensor is setting standards by producing sensors from a diameter of 0.15 mm. Frequent calibration tests in our excellently equipped DAkkS accredited laboratory as well as detailed quality controls guarantee a consistent accuracy of our temperature sensors. For use in potentially explosive atmospheres we are able to offer sensors according to ATEX and IECEx (Ex nA) which allows us to find innovative solutions in nearly all industrial applications. The appropriate certificates are available. Our customers include numerous renowned companies in the automotive industry, food industry, chemical and pharmaceutical industry as well as aluminium and steel processing companies. Have a look at our Resistance thermometers! Thermocouples for industrial applications are preferable for temperature ranges up to 2000 °C. 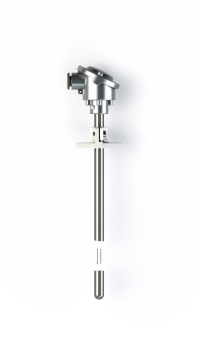 Sheath thermocouples are used for precise temperature measurements. Due to their mechanical robustness and shock resistance they can withstand different requirements. 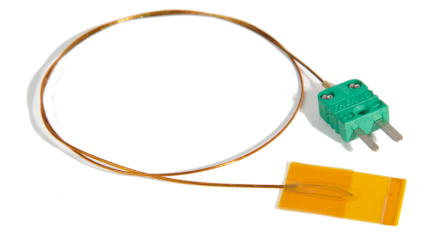 Thermo Sensor is able to supply sheath thermocouples from a diameter of 0.15 mm. 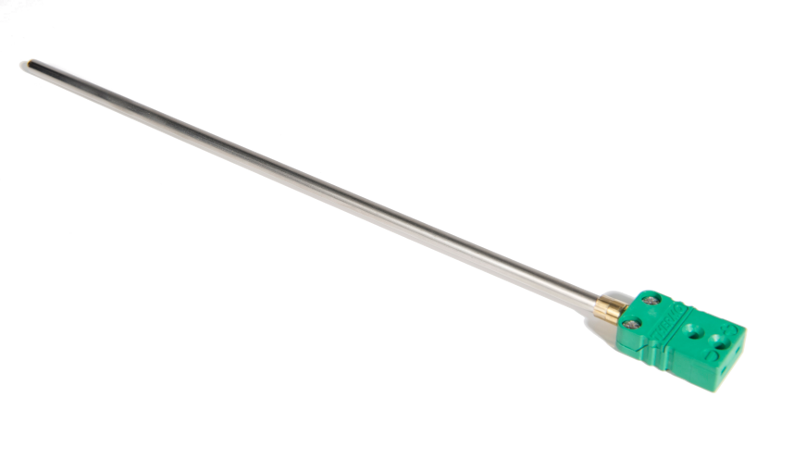 Sheath thermocouples cover a wide temperature range and are characterized by fast response times. Therefore they can be adapted to the individual measuring task. The special internal design allows applications with high pressures and vibrations. Sheath thermocouples are particularly suitable for measuring temperatures of gaseous and liquid media. They are versatile and ideal for difficult room conditions due to their high flexibility. Due to the systems purpose-built design, all components offer protection against high-voltage for up to 6 kV. Furthermore, all contacts and conductor materials are made of class 1 thermocouple material type K, which makes the system especially suitable for temperature measurement. The correct polarity of the connection is assured by correspondent guidance bars in both plug and jack. A safety clip prevents accidental disconnection. Two insulated thermocouple wires are inserted in the jack, which can be connected to the electric control unit. 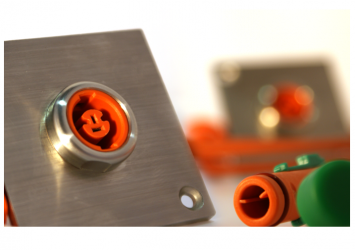 The plug will be delivered with a moulded temperature probe. Generally, this would be a thermocouple wire probe. Available are various diameters and insulations (e.g. teflon or kapton), depending on the stipulated withstand voltage. Additionally, also a version with a moulded or mineral-insulated thermocouple is available (with a diameter of up to 3.0 mm), but in this case the withstand voltage is limited. Both parts, plug and jack, can be sealed with caps while disconnected, so the protection of IP 67 is always guaranteed. 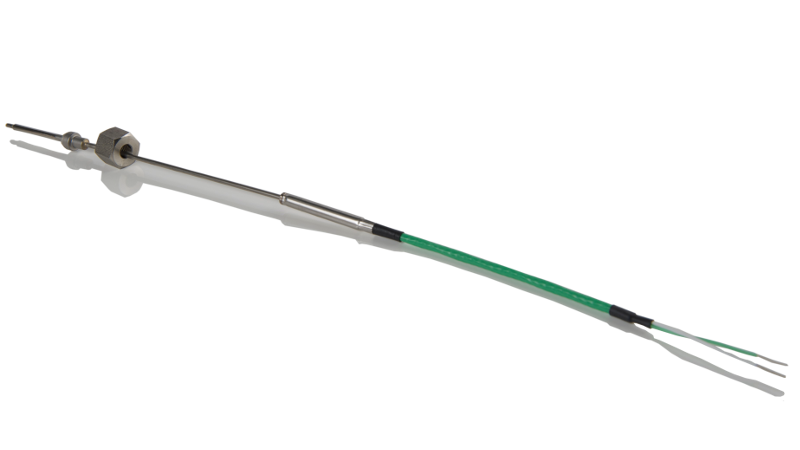 Sheath thermocouples with connected cable are versatile due to their diversity. They are available in different lengths, diameters, isolations, sheath materials and shieldings and are therefore flexibly adaptable to the respective local conditions. The materials used depend on the external environments and temperature ranges at site. 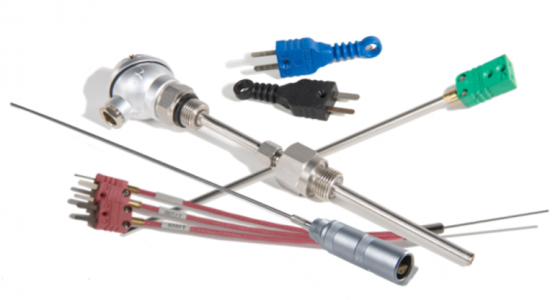 Thermocouple wire probes are available in various designs and are used for surface temperature measurements. 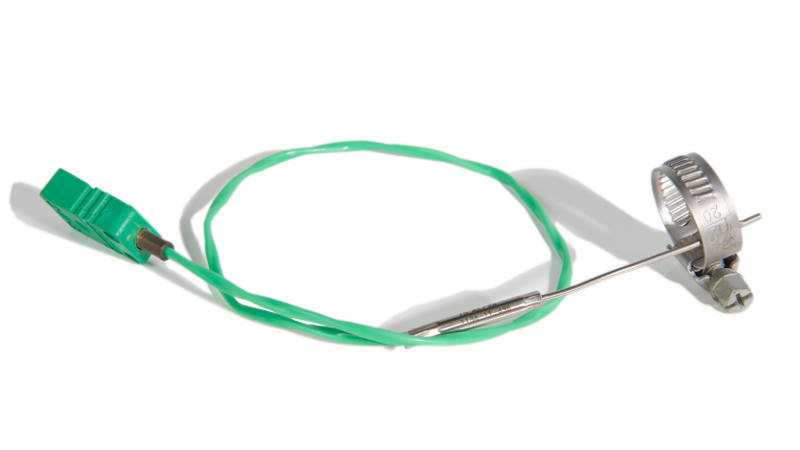 The probes can be supplied in differnet lengths, diameters with glue pad, magnet, screw tap or with a clamp. Frequently, a thermocouple connector is being attached to the cable and the probes can be easily connected to the processing unit or data logger. Usually, thermocouple wire probes are characterized by fast response times due to their low mass. Thermocouples for automotive applications are high-precision sensors and are very often used in the aerospace industry. A lot of data has to be collected and processed reliably when it comes to measuring the exhaust gas temperature and the temperature in the cockpit. 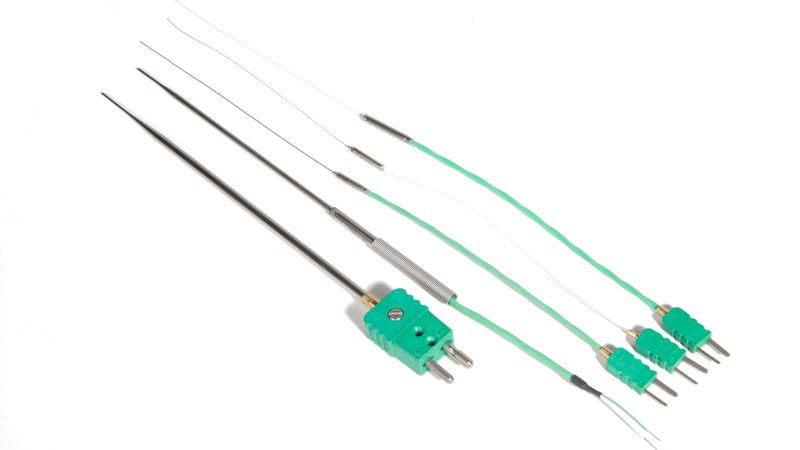 These thermocouples are available in various versions e.g. as glue sensors, screw-in sensors or as a multiple extensions for simplifying the leading of the measuring points through the test vehicle.